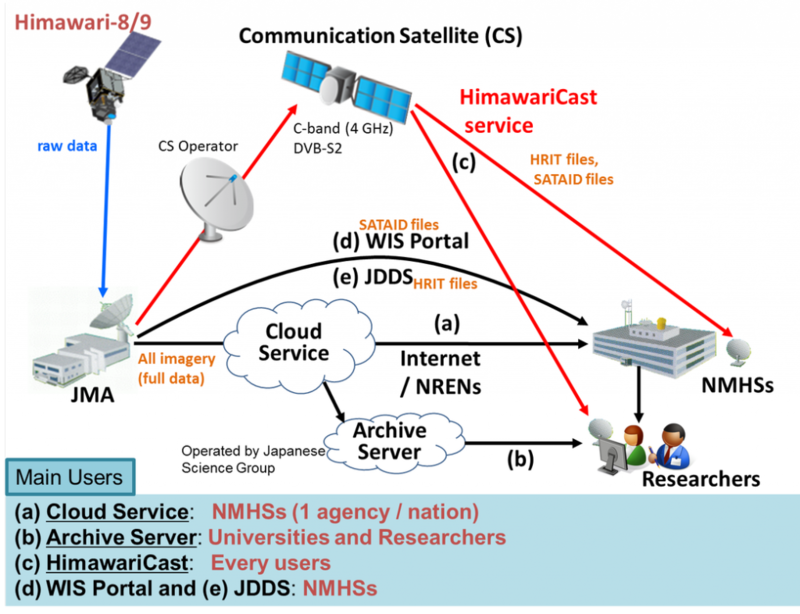 Himawari-8 and 9 (“sunflower”) are Geostationary Meteorological Satellites that form the third generation of Himawari satellites operated by the Japanese Meteorological Agency (JMA) for use in operational meteorological application. 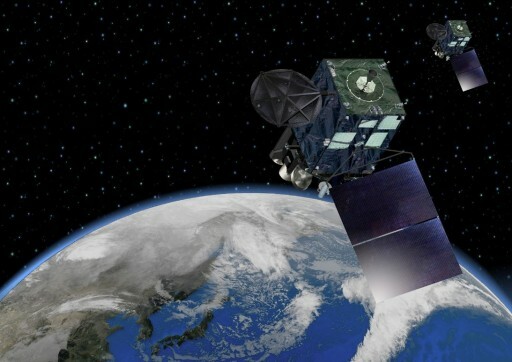 JMA began operating weather satellites in Geostationary Orbit in 1977 when the first generation of Himawari satellites was inaugurated known as GMS – Geostationary Meteorological Satellites. 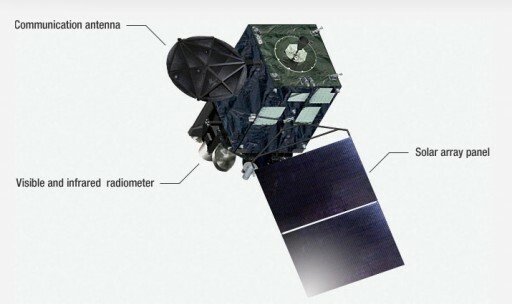 The Himawari-8 and 9 satellites are identical spacecraft, both built by Mitsubishi Electric for operation by the Japanese Meteorological Agency. 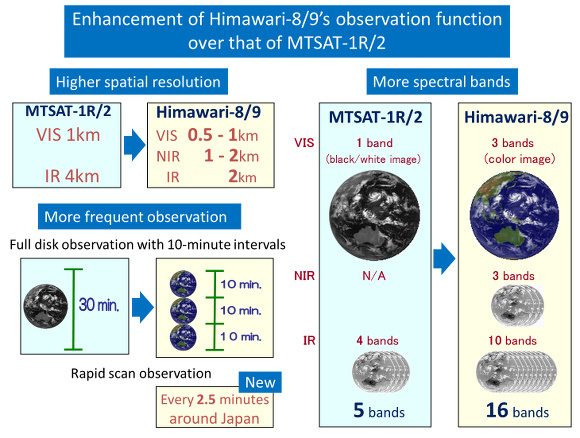 Both satellites host one core instrument – the Advanced Himawari Imager, and two supporting instruments, the Space Environment Data Acquisition Monitor and the Data Collection Subsystem. The satellites are based on Melco’s DS-2000 satellite bus that originated in a JAXA satellite design that was modified by Mitsubishi Electric to create a versatile Geostationary Satellite Platform that could support a variety of payloads. DS-2000 first flew in 2002 and has been used for a number of Geostationary Communication Satellites. The platform is also used for data relay spacecraft, weather satellites and future navigation satellites. 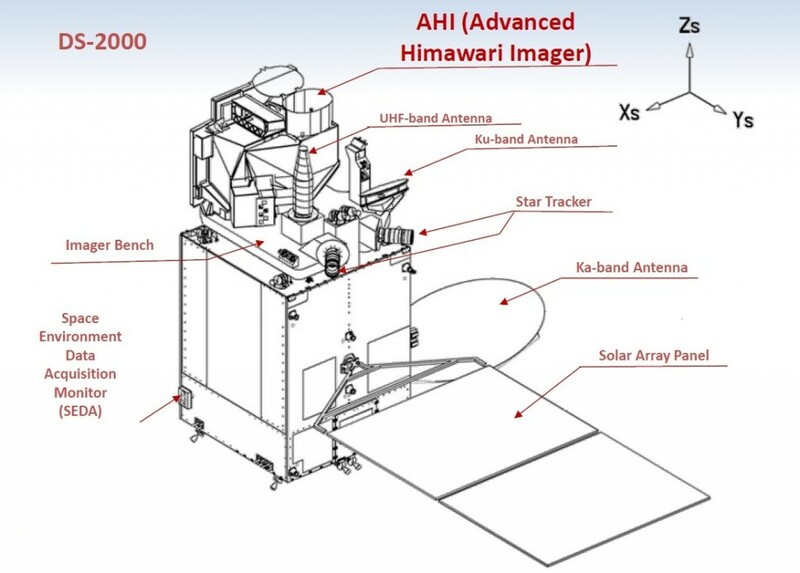 The Himawari-8 and 9 satellites are equipped with a number of attitude sensors. Coarse Sun Sensors are used for initial attitude acquisition and to keep the solar array pointing at the sun in spacecraft safe mode. The primary attitude sensors are two star trackers which acquire imagery of the sky that is analyzed by a software algorithm that compares the acquired star pattern with a catalog to precisely determine the spacecraft’s orientation in space. Each star tracker has a field of view of around ten degrees and uses a CCD detector operating at 1Hz. 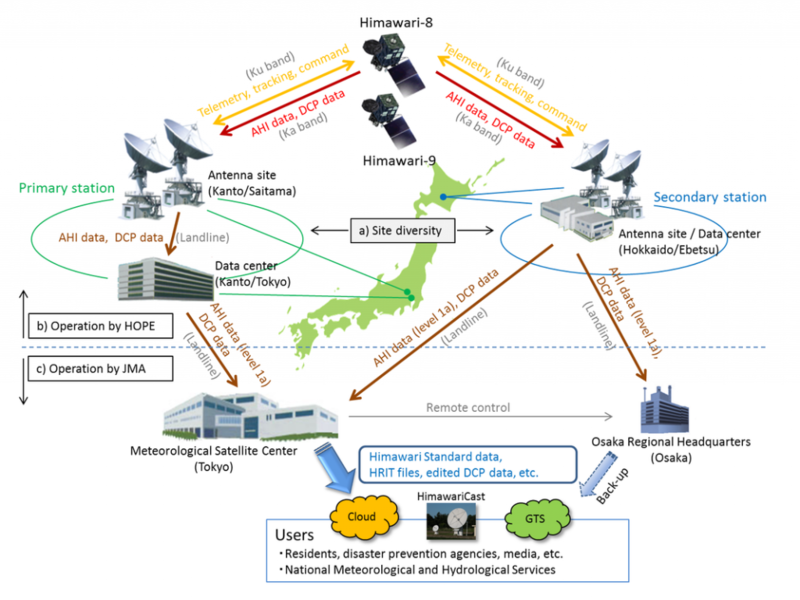 Himawari-8 and 9 use three different communication frequencies – Ku-Band, Ka-Band and UHF. A Ku-Band antenna is installed on the Imager Bench facing the Earth to provide Telemetry and Command services. Spacecraft commands are uplinked at a data rate of 500bit/s at a frequency of 13.75 to 14.5 GHz while the downlink of real time or stored telemetry and housekeeping data reaches 15.36kbit/s at a frequency of 12.2 to 12.75 GHz. 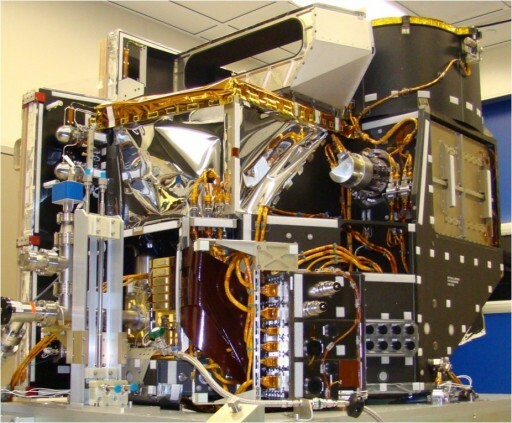 The main instrument of the Himawari-8 and 9 spacecraft is the Advanced Himawari Imager – a multispectral imaging payload developed by Exelis. It covers 16 spectral channels from the visible spectrum into the infrared wavelengths marking a major increase in channels compared to heritage instruments. 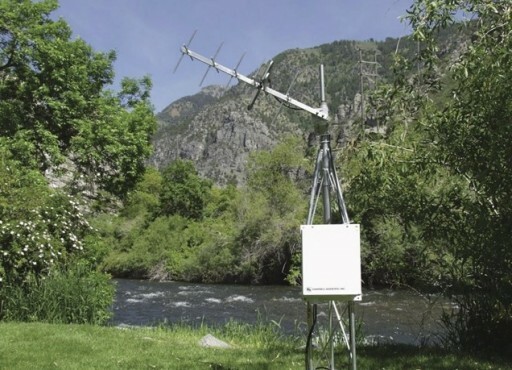 AHI’s improved data quality will enable better nowcasting, improved numerical weather prediction accuracy and enhanced environmental monitoring. 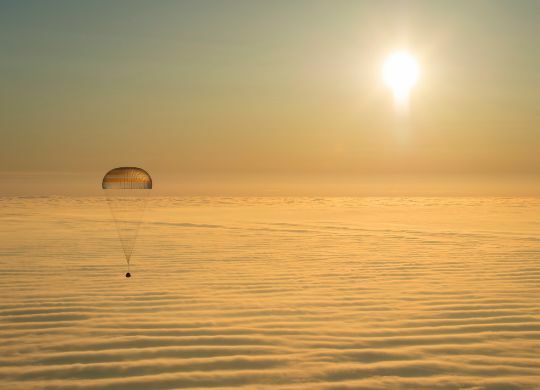 The main payload operates on a 10-minute timeline when in nominal operations mode. This timeline includes the acquisition of different images at varied intervals. 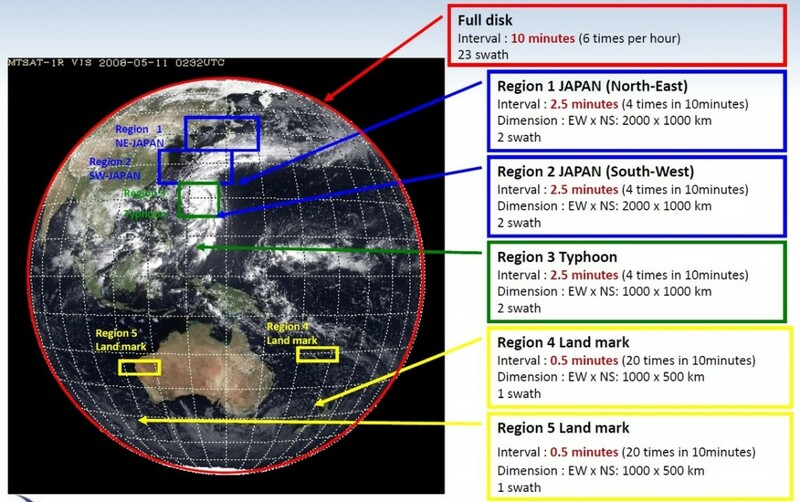 Full-disk images of the entire planet as seen by the instrument are acquired once every ten minutes requiring 23 South-North Swaths to be taken. Three regional frames will be acquired every 2.5 minutes. Region 1 stretches 2,000 Kilometers from east to west and 1,000 Kilometers from north to south covering the north-eastern portion of Japan. 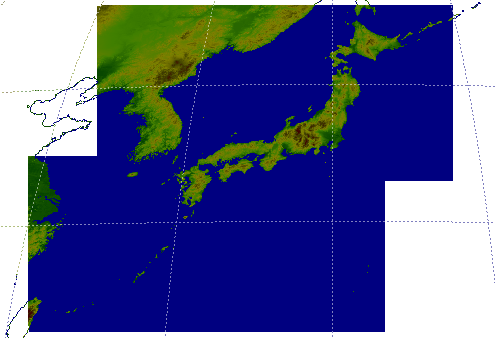 Region 2 covers south-west Japan with the same dimensions as the first region to allow AHI to obtain imagery of the Japanese territory every two and a half minutes. These two regions are fixed in position. Region 3 is 1,000 by 1,000 Kilometers in size, also requiring 2 image swaths acquired every 2.5 minutes. Unlike the first two regional images, Region 3 can be targeted as needed in order to allow AHI to obtain imagery of targets of special focus such as Typhoons. Two Land Mark Regions are also part of the 10-minute routine – these images are taken every 30 seconds and only require one swath to be acquired since the images cover a ground region of 1,000 by 500 Kilometers. Land Mark regions are flexible, but will initially be fixed to serve as navigation references. Later in the mission, these regions may be assigned to targets for the study of rapidly developing cumulonimbus clouds and other phenomena. This results in 49 images taken per 10-minute timeline or 7,056 images returned per day without outages due to housekeeping operations. 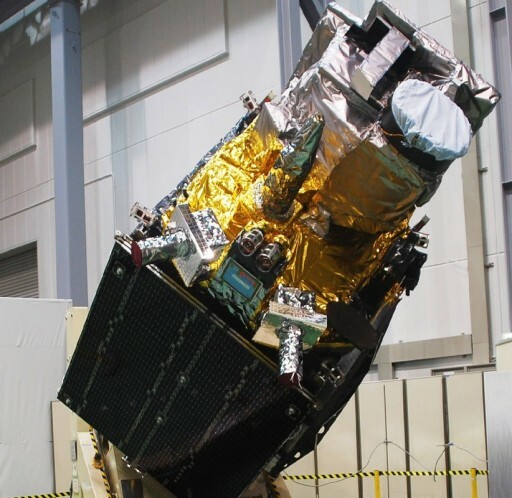 The third payload carried on Himawari-8 and 9 is the Space Environment Data Acquisition Monitor, SEDA, which will measure the radiation the satellites are exposed to in their Geostationary Position at 140 degrees East, 35,786 Kilometers above Earth. The compact sensor features plug and play interfaces for integration on a variety of satellite platforms to create an operational constellation of space weather monitoring assets. 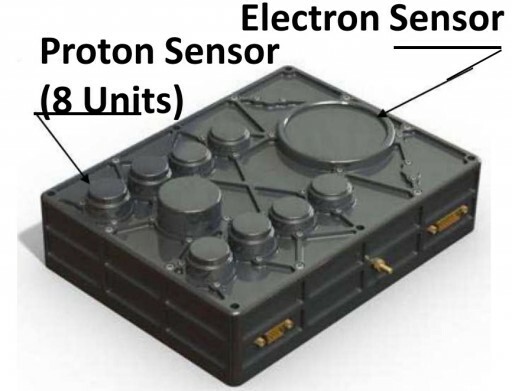 The sensor includes eight channels for protons consisting of eight individual sensor elements, and a single eight-channel electron sensor. Protons at energy ranges from 15 Mega-Electronvolt to 100 MeV are covered by the sensors while the energy range for electrons stretches from 0.2 MeV to 5 MeV. The instrument delivers data at a temporal resolution of 10 seconds. The proton sensor has a field of view of +/-39.35 degrees while the electron sensor covers a FOV of +/-78.3 degrees. SEDA data is delivered to ground stations in real time for release as part of space weather reports used by satellite operators and scientists.